Beautiful light fixture. Recently moved into an apartment where the light fixture was rusted. Super easy to install and looks beautiful in the bathroom! 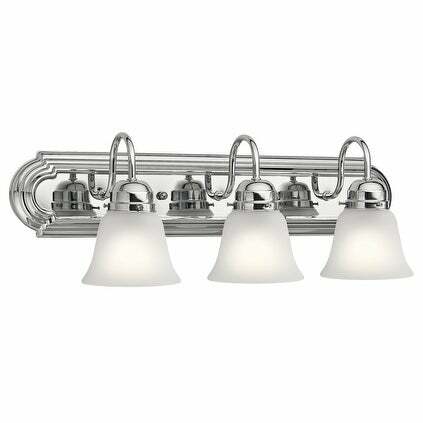 This 3-light bath/vanity light features a chrome finish that will complement many traditional decors. Clean lines of the steel frame add interest while satin etched glass shades soften the light to create a warm ambiance for any bathroom or vanity space. Dimensions: 8 inches high x 24 inches wide x 8 inches deep. Dimensions 8.0 In. X 24.0 In. X 8.0 In. I am very pleased with the lighting fixtures I purchased for two bathrooms in my home. The size and style is perfect for a smaller space. The frosted glass shades are very pretty and match my decor. Good purchase. Very please with this. A small piece can bring a big change. Just by changing my light fixture and sink, I’ve got a whole new bathroom. This piece is great bang for the buck. Brightens up the space and looks stylish. It was very easy to install! "Is the wattage for this product 100 watts for EACH lightbulb or for the three light bulbs combined?" Correct each bulb can be up to 100w.